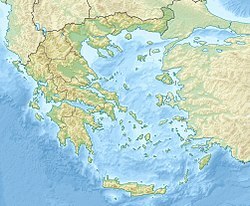 The 2008 Dodecanese earthquake occurred near Kattavia on the island of Rhodes in the eastern Mediterranean Sea on 15 July. The quake struck at 06:26 a.m. local time (UTC+3) and one woman was killed when she slipped and fell as she tried to flee her home. However, the earthquake did not cause any major damage. The earthquake was felt across the entire eastern Mediterranean, as far west as Libya, and inland as far as Damascus. ^ USGS. "M 6.4 - Dodecanese Islands, Greece". United States Geological Survey. ^ a b c "Rhodes Quake Kills One". E-Kathimerini. 2008-07-15. Retrieved 2008-07-29. ^ a b "M 6.4 - Dodecanese Islands, Greece" PACER system, Earthquake Hazards program, United States Geological Survey Archived 2008-07-31 at the Wayback Machine. Accessed: 29 July 2008. ^ Staff (15 July 2008) "Strong earthquake hits Greek island of Rhodes" Belfast Telegraph. Accessed: 23 August 2008. ^ "Earthquake strikes Greek island of Rhodes; no damage, injuries reported" International Herald Tribune. Accessed: 29 July 2008. ^ "Seismicity Catalogs" for 15 July 2008 23:52 UTC, Geodynamics Institute of the National Observatory of Athens. Accessed: 29 July 2008.